What is a Cessna 152 ? Find out about this wonderful airplane which has proven to be such as success that thousands were built between 1957 and 1982, many of which are still flying. The Cessna 152 is one of the smallest 4-cylinder engine airplanes in use. It has served as the standard flying-school airplane for decades. I decided to rent one for my trip for two reasons: it was the aircraft I had had most of my flying experience in and it was also the cheapest to hire. This plane was designed in the late 50's (as far as I can tell) by Cessna Aircraft, who for years have been the largest producers of small airplanes in the world. 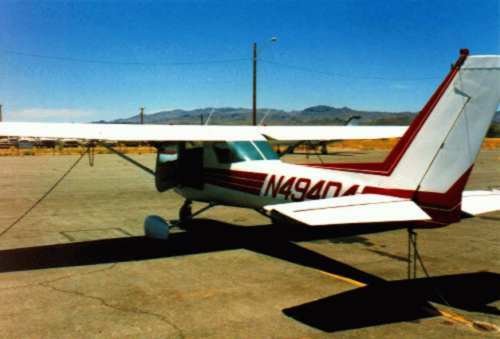 The Cessna 152 quickly became a major success for the company who built them continuously until the 80's, though with minor cosmetic improvements. The Cessna 152 is a very robust all-metal two-seater trainer, with a design that now looks rather old-fashioned compared with the lighter, modern, synthetic fiber planes, or even with the wonderful wood-and-cloth Robin. But most people who have flown Cessnas for any length of time like them because they're so forgiving and they are, after all, the plane most people learnt to fly in. With just the pilot and some luggage, the two-seater can take on 37.5 gallons of usable fuel in both wing, giving you about 5 hours of flying time. If you are generous and count on a 100 knots of cruise speed, (forgetting allowances for taxiing and climbing) that gives you a range of about 500 Nm, or 900 km. Of course, if you use less power your endurance will go up, but your speed will decrease. However, you can achieve a greater range by decreasing the power, but since you're renting by the hour, who cares?